At once modern and classic, this men's tungsten wedding band is perfect for those seeking an alternative to the standard metallic hues. 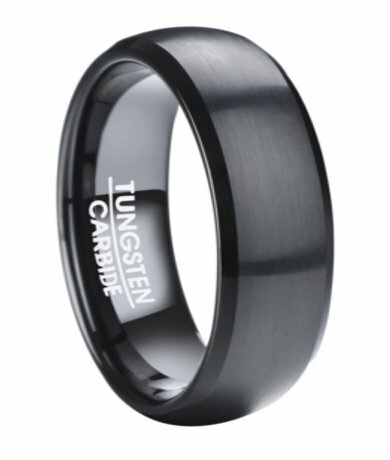 This men's black tungsten ring has a rich ebony hue with a satin finish, narrow polished beveled edges, a slightly domed profile and 8mm comfort fit band. Comfort-fit rings should be ordered 1/2 size smaller! 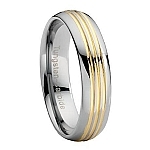 my husband loves his ring, and is super durable.i have already suggested this site to several of my friends. I ordered my fiancés wedding ring from this site and I had an awesome experience! They have great selection and great prices. I ordered the ring and it went out the next day, is was able to track it everyday online and it shipped fast. I received it in less than 2 weeks. Very please and would order off this site again.